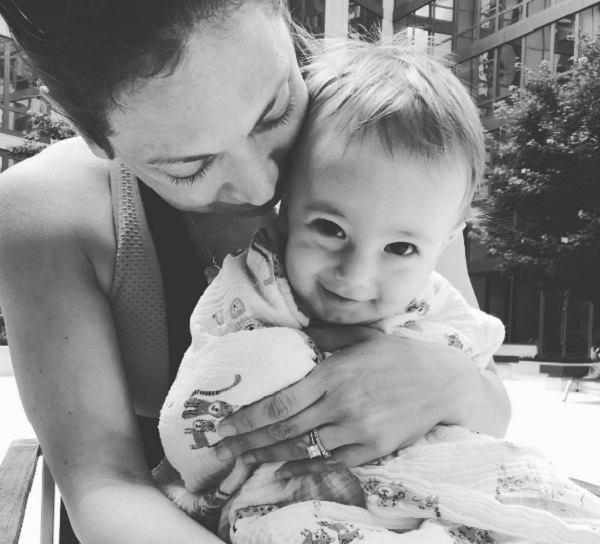 Good Morning America news anchor and Dancing With The Stars finalist Ginger Zee took to Instagram to share the most adorable video of her handsome baby boy Adrian learning how to swim. A year ago Ginger Zee announced on GMA that she and her husband Ben Colonomos were expecting their first child together. Zee gave birth to Adrian Benjamin in December 2015. It’s going to be HOT today – find a pool like Adrian! Before Ginger Zee returned to work on Good Morning America after Adrian was born, she announced on Good Morning America that she was joining the ABC dance competition Dancing With The Stars. Ginger is not the first celebrity mom to join the reality TV show right after giving birth to a baby in hopes of getting whipped back in to shape and getting back their post-baby body. Not only did Ginger burn a few calories, but she nearly won the last season and made it to the finals! This week the meteorologist posted an adorable video of baby Adrian learning how to swim in a pool. She captioned the Instagram video, “It’s going to be HOT today – find a pool like Adrian!” It looks like Adrian is turning out to be quite the little water baby, she also shared a sweet photo of him in the bath tub this week. Zee’s handsome baby just turned 7 months old, and he is absolutely adorable! We’re thrilled that Ginger gives us a sneak peek of her family on social media and we are getting the opportunity to watch Adrian grow up right before our eyes!